The Gulf Cooperation Council states have drastically reduced subsidies of fuel, with the exception of Kuwait, which planned to reduce fuel subsidies but met stiff resistance from Parliament. At the end of March, Kuwait’s government announced plans to increase electricity and water fees in a structure divided by usage volume. The highest fee increase would go to commercial users, while residential units would see modest increases. Not surprisingly, the early evidence suggests that the GCC’s most active legislative body is putting up the toughest fight against economic reforms. The success of the reduction of fuel subsidies for the other GCC states (Saudi Arabia, the United Arab Emirates, Bahrain, Qatar, and Oman) is also mixed. Even with reduced subsidies, prices for gasoline remain very low by international standards across the GCC. (See chart below.) While Gulf citizens have been inundated this year with the new economic reform discourse, it is not clear that easing into the reforms with the reduction of fuel subsidies is really making a difference in meeting the challenge of fiscal deficits. Moody’s estimates that fiscal deficits will average 12.4 percent of gross domestic product across the GCC in 2016. There is a difficult choice for governments to make. A drastic reformation of the political economy, as in a shock therapy approach removing government support for various services, would certainly risk political and social destabilization. Alternatively, a piecemeal introduction of reforms may familiarize citizens and residents with a new pattern of state-society relations, but will do little to repair the damage of the prolonged oil price slump on government revenue. The prolonged decline in oil prices since 2014 continues to challenge GCC governments to compensate for spending expectations with reduced revenue. While the break-even price of oil is not an exact number for any state – especially for states with rather opaque budget reporting – there is some important variation emerging among GCC states. The states that have high spending expectations, requiring high oil prices in order to meet projected outlays often because their output capacity is low (Bahrain and Oman) or their fiscal expenditure is high relative to revenue (Saudi Arabia), are facing the most pressure to introduce further economic reforms that will reduce government outlays. They are also under the most pressure to diversify their sources of government revenue away from natural resources. The three GCC states with lower break-even prices, between $70 and $50 per barrel, (the UAE, Qatar, and Kuwait) have some important similarities, particularly that they are all good at saving, or at least using their sovereign wealth funds to create buffers for times of low revenue. Kuwait is the key example; though it earns less now from carbon exports than its peers Qatar and the UAE, it has saved wisely. The UAE and Qatar are the least dependent of the GCC states on natural resources, with oil and gas revenue accounting for less than 70 percent of government revenue. For Bahrain, Oman, and Saudi Arabia, break-even prices are in the range of $95 to $105 per barrel, according to data from Moody’s. Meanwhile, oil prices are projected to stay near or below $40 per barrel through 2016. The underlying problem of a reduction in government spending is the reaction of Gulf societies, comprised of both citizens and residents. Whether citizens tolerate reduced subsidies, the introduction of taxes, and changes to the caretaker state will depend a lot on how much room they have in family budgets to assume those expenses. For migrant workers and long-term expatriate residents, the choice to stay or go will be financial and an evaluation of opportunity cost, compared to what they might earn and how they might live in their home countries. For Gulf citizens, there is a wide disparity in what people earn and the portion of their incomes that would have to be dedicated to newly unsubsidized goods and services. With reduced fuel subsidies, citizens in Oman, Bahrain, and, to a lesser extent, Saudi Arabia, will have to dedicate a larger portion of their family budgets, which are the lowest of the GCC states, toward fuel. 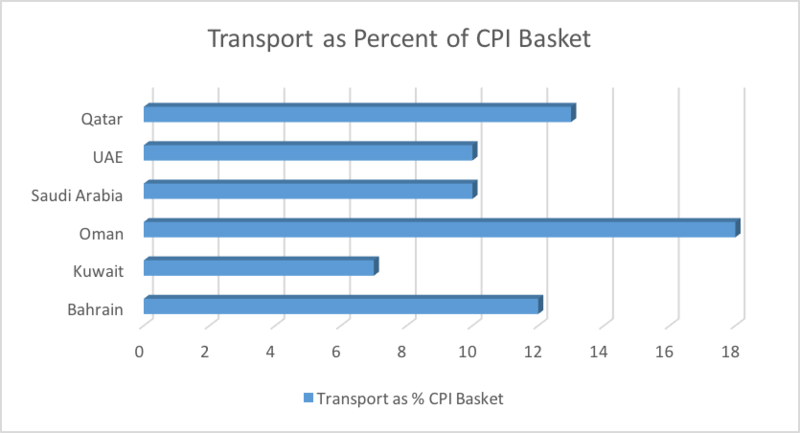 Transport makes up a higher portion of the consumer price index basket (what an average family buys on a regular basis) in Oman and Bahrain. Transport is an important cost to Qatari families, but their incomes are substantially higher than those of their GCC neighbors, with per capita income at nearly $140,000 per year, compared to Oman’s at just over $40,000. Governments are under extraordinary pressure to choose reforms that will have the greatest fiscal impact in savings and the least social impact in quality of life for citizens and residents. According to the International Monetary Fund, total energy subsidies (including fuel and electricity) cost the GCC states nearly $60 billion in 2015, or on average 3.6 percent of GDP. (This cost has gone down considerably from 2013, at the height of the oil boom, when energy subsidies cost the GCC states as much as $106 billion.) The reduction of fuel subsidies, though an important political signal, is not a reliable deficit reduction plan on its own. Furthermore, the mechanism of subsidy reduction differs across the GCC. Only the UAE, with its monthly committee review, has attempted something close to deregulation of fuel pricing, which is meant to be based on global oil prices. Oman is instituting a similar price-by-committee review process, but Saudi Arabia, Qatar, and Bahrain have made one-off price increases, which may be static or easily revoked. By creating an institution or procedural body that reviews fuel prices along with government needs and international oil prices, there is a modicum of regularity and market logic. As new research from Moody’s indicates, the fiscal gains of gasoline price increases are small relative to budget deficits. For example, Saudi Arabia has increased the price of gasoline by 50 percent, yet the impact on savings, as a percent of GDP, is less than 1 percent. Bahrain has made a similar increase in gasoline prices, yet the impact will be minimal in savings. Oman and Bahrain face the largest budget shortfall projections for 2016. While the signaling of economic reform has important political and social effects, in changing the way people begin to think about the role of the state in the economy and the provision of public goods, right now the calculus of economic reform needs to be oriented toward deficit reduction and developing new sources of government revenue. Decreasing fuel subsidies is a drop in the bucket. However, combined with a systematic effort of small savings and fee-based revenue, there could be budget relief on the way. The introduction of airport departure fees in Dubai and Sharjah is an example of a way of monetizing assets and spreading the introduction of tax and fees liberally across national and non-national populations. Saudi Arabia may go much further with proposals announced by Deputy Crown Prince Mohammed bin Salman to sell off a portion of Saudi Aramco shares to build a giant sovereign wealth fund. This is a disproportional privatization scheme in that a large amount of wealth can be generated from a small amount of equity, while effectively retaining state ownership. The wealth that is generated from the sale of shares on a presumably public offering will still be held by a small group of investors – most likely local. The distribution of the sovereign wealth fund earnings also remains captive to a small circle of decision makers. Calibrating the demands of reduced government revenue and tolerance for fiscal reform may be the greatest challenge in economic governance the GCC states have faced. Austerity, subsidy cuts, and diversification are buzz words in the Gulf states right now.